This traditionally built, bright hull Bluenose was built right here at Stevens Boatworks in 2003. She was constructed to the original specifications of the designer, William J. Roue, of the finest materials; mahogany planking on steam bent oak frames with stainless steel fastenings. One particular problem plagues most wooden hulled Bluenoses – broken and cracked frames. It could be that oak back in the 1940’s was of better quality than now or it could be that the frame scantlings were desgned a tad light. Either way, it was a problem that the owner asked us to repair. 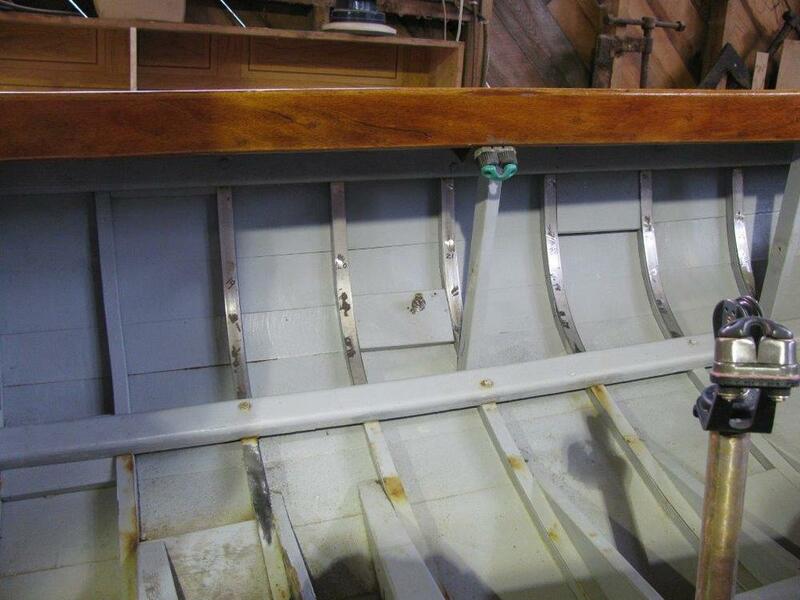 Back in the shop a survey and assessment of the frames revealed all frame damage to be located between the shear clamp and bilge stringer at a fastening. A total of 16 frames were nominated for repair. After the pros and cons of the available repair options were weighed we elected to proceed with stengthening the frames by overlaying with stainless steel flat bar. A template was made of each frame and the flat bar, which was the exact width of the frame, was accurately measured and cut. Our metal roller formed the flat bar in the exact shape of the frame. Once in position on top of the frame the drilling and tapping started. On the outside of the hull the bungs were drilled out with a forstner bit and the screws carefully backed out. Through the original screw holes we drilled the frame and the steel then went in with a 5/16” tap and cut threads in the steel. A 5/16” machine screw securely fastened the planking, frame and stainless flat bar together. 80 holes later we were done; bungs glued in, machine screws cut off flush on the inside. Once the interior paint is touched up the flat bar will be inconspicuous to all but close scrutiny. This procedure resulted in a strong, economical and long-lasting repair. Once the weather warms the hull will be refinished; then out the door she will go for many more years of enjoyment.